Looking for more tips on how to shop in Paris like a local? Be sure to get our 2019 INSIDR Paris Shopping Guide! While you are in Paris, it is obvious that you will be spending some time shopping. So why not try to find the best places to shop in Paris? The concept stores in Paris are a great way to start! A concept store is focused on a certain theme and usually devoted to a specially selected collection which goes beyond the simple store mindset. Luckily, in Paris, there are many options you can choose and visit with different themes! Here is INSIDR’s selection of the best concept stores in Paris for you! Bon shopping! Factory’s is located in the heart of Le Marais neighborhood. The boutique primarily focuses on men collection. It was founded in 1992 for men here, long before Le Marais became a hip location for shopping and artsy activities. At Factory’s, you can find anything for a man. The collection is changing and adding new additions frequently as well. According to the new trends an styles of the season, you may find something unique and end up with nice treasures! Factory’s might be a great place to find a gift for your boyfriend, brother or even your dad. Here, you can find anything from shoes, bags, jewelry, scarfs, shirts, sunglasses. The brands also change within the collection but some examples include Scotch and Soda, Petrol, Jack and Jones, Sasha Berry and Billybelt. Factory’s ready-to-wear pieces and accessories are carefully chosen for their selection at the boutique. No matter what your style is, as a man there is always something to grab by here. Although you should be warned, you might want to end up buying the whole collection here! We are Paris is a concept boutique that focuses on locally made products. Besides being local, the founder of the boutique – Céline carefully selects handmade, eco and sustainable friendly products. These are made with French materials in France, mostly in Paris. By shopping from We are Paris, you simply support the local economy and well-being of the local producers. Céline proudly supports the local and ethically working designers and producers. At this cozy boutique, you are able to find many different types of items. You may end up buying a necklace made at a jewelry atelier nearby, handmade notebooks, artisanal soaps or candles, even some chocolates made in Paris! We are Paris is a unique place that gives you an important insight into the city’s own producers, life, style as well. That’s why the name of the boutique is also very meaningful, each detail you see here is coming from something or someone who belongs to Paris. Allez vite dans la merveilleuse @boutiqueweareparis – 13 rue Oberkampf, 75011 Paris✨ Popcorn, bijoux, cactus, bougies…! Craquez pour toutes ces créations 100% Made in France ! Impossible de résister ! ?? We are Paris is an amazing place to have a memorable item from Paris. Either it is a souvenir or not, you will notice that the collection of the boutique is very unique, very refined and very Parisian at the same time! Don’t miss a chance to take a look at these beautiful products here, maybe have a chat with Céline and even learn the story and the producer about these products as well! Le Bazaristain is located on the west part of the center on 17th arrondissement. Two of the boutiques are here and close by to each other. The concept of Le Bazaristain is quite eclectic. Here, the items you will see are hip, quirky, trendy, off-beat but which still carry a taste of style, elegance, and quality. Le Bazaristain’s collection represents unique pieces from all over the world with eclectic character and a sublime style. 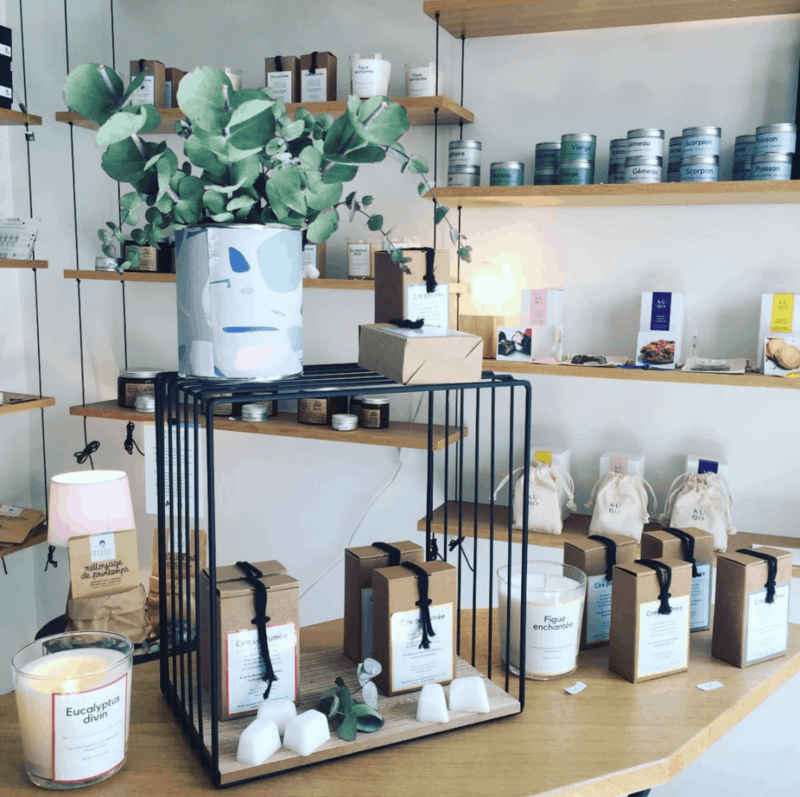 Here, you can find anything from designer bags, exclusive scented-candles, Japanese incense, limited edition ceramic sets, bamboo cutleries, statement jewelry, home decors, and many others! It is almost impossible to leave here without finding something genuine for yourself! As soon as you step in, you will realize everything is such an eye-candy here. Displays are super vibrant and joyful, you will certainly lose the time while you are wandering inside the shop. Le Bazaristain has a super nice product selection, that’s why everybody can find something unique for themselves here. Bows and Arrows is a concept store solely devoted to high-quality Japanese products. Arrow and Thierry are the founders of the store and they are highly passionate about their business! Each year they pay a couple of visits to Japan to expand their selection of products and search potential brands to add their collection at the store. The items are not only Japanese but they are masterfully crafted, high quality and meticulously designed products. Each week, they have new additions to the collection. So there is always something new and exciting to see and explore in the store as well. Besides the selling Japanese products, Bows and Arrows also contributes to the cultural representation of Japan. They hold Ikebana workshop, tea ceremonies, movie nights or origami days as well. You can also join these activities here to enlarge your knowledge about Japan. The store has a large variety of product categories as well. You may find anything from hand-made makeup brushes to Japanese antiques; to famous Japanese steel knives to gourmet foods. The owners are glad to answer if you have any questions about the products. They are very knowledgeable about their collection of brands. To discover a different perspective of Japan in Paris, make sure to stop by at Bows and Arrows! Noyoco is a Parisian brand that puts the ecological impact and environmental practices to the first place in their production. Before creating their pieces, they first care about the planet and the outcome of their manufactural practices. Noyoco is a clothing brand that uses local, organic, recycled materials to create new clothes. The idea behind their concept is to decrease their productional waste, carbon emission, intermediaries of the production and marketing – just to create more sustainable clothing brand and be a better part of the fashion industry. The pieces of Noyoco represent the modern culture with classic designs. The clothing items here are timeless, they don’t belong to a certain fashion era which makes them even greater. They keep in mind that that have the eco-responsibility of producing your clothing. Although it is a very challenging part of their industry, they do this very successfully. Noyoco is a great place for eco-friendly items such as shirts, jackets, sweaters, t-shirts – both for men and women. Each week they drop new items to their collection as well. They have two different boutiques in the city, one on 17th and one on 3rd arrondissement in Paris. To try on their pieces and explore their pieces head over to their “sustainability meets cool” store, you will fall in love! Empreintes is a collaborative project that has brought into life by Ateliers d’Art de France. Ateliers d’Art de France is a federation that focuses on professional fine arts and crafts. The concept store of Empreintes was founded especially to create a platform for the master crafters and artists. Therefore, it is a very special reflection of the unique production, style, material selection, and the craftsmanship of each creator. Réouverture ! ✨ Venez nous voir et découvrir toutes les nouveautés sur nos 3 étages aujourd’hui jusqu’à 19h. The selection of Empreintes is quite extensive yet each item still has a very genuine place. Most of the creations are either limited or only have a single copy; which is quite rare nowadays! Over 1,000 crafted items are sold which are handmade at the atelier of French craftspeople! In case you are looking for a genuinely made gifts in France – here is exactly what you are looking for. Le samedi, le concept store vous accueille de 11h à 19h. So, what you can find at Empreintes? All of those carefully produced items that you can imagine – tableware, pillow, cutlery, ceramics, music instruments, jewelry, toys, furniture and even sculptures and many more! And do not to forget all of these are handmade, sustainably produced and unique items! Every person will find a special treasure for their own taste here. You will fall in love with Empreintes, their eclectic collections, and exclusive style! Gab & Jo is a France-themed concept store in the Saint-Germain-des-Prés neighborhood. This cozy little store has one of the most magnificent, fun and hip French items that you can find in Paris! Without a doubt, it is one of those great places to grab a Parisian or a French style gift. When you are visiting Paris, make sure you stop by at Gab&Jo to discover their adorable collection! Alexis and Fanny carefully select the items for their store from French brands. However, these brands are delicately chosen by the founders. In fact, you’ll notice that the items are not regular but more off-the-track, eclectic and genius creations from France -made in France! You can find design plates, tableware, beauty products, quote t-shirts, and even French-themed fun socks! Forget about the low-quality souvenirs, boring magnets or lousy cups! Gab & Jo is a whole another world for you the find the high-quality souvenirs, witty and fun clothing items, and hip French products! However, it is hard to keep your hands away from all these beautiful items in the shop! Say hi to Fanny and Alexis, try on some Frenchie t-shirts and grab your perfect “a la Française” gifts from Gab&Jo!